I admire these humble “slow” cloths, so carefully created and preserved, so respectfully employed in the service of community. 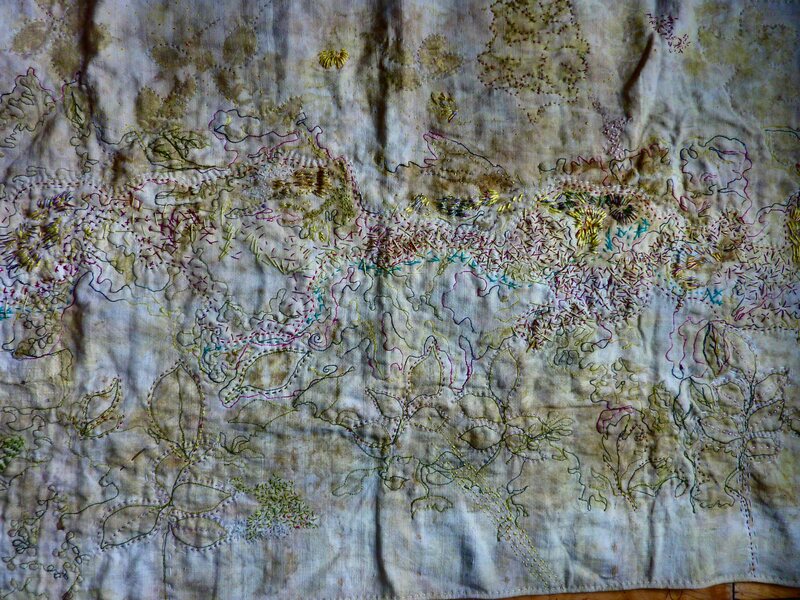 And since many of them are stained by that daily service, as we are by life, I was inspired to work through that idea: To stain and mark the cloths further, but with the beauty of natural dyes from my own garden plants and with embroidery, just following the marks. It was a way to honour daily tasks, their life-giving dignity not always registering as we carry them out. 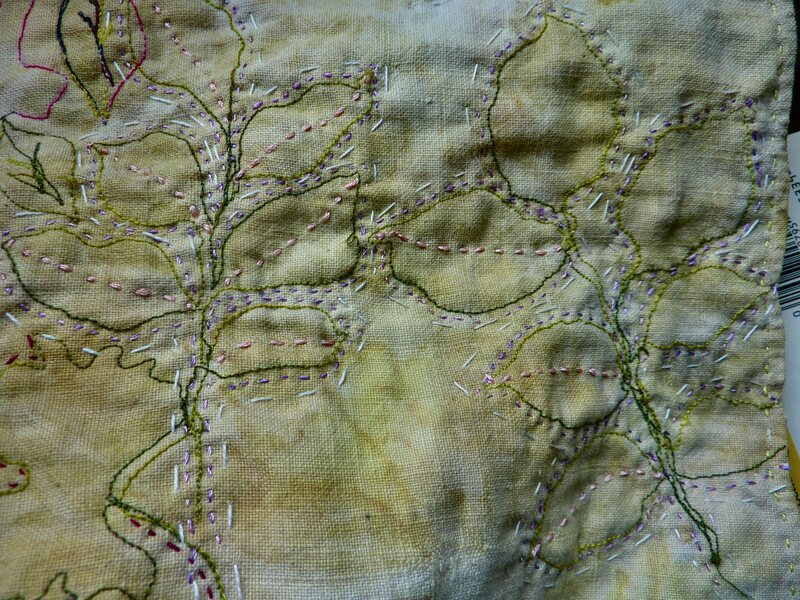 So I have made my own registrations ( printing with plants, marking with threads, staining with dyes) on this first refectory cloth using rose leaves from my garden, not only to recall the rosaries the sisters recite but to let me share somehow in the stories in the prayer cloth. 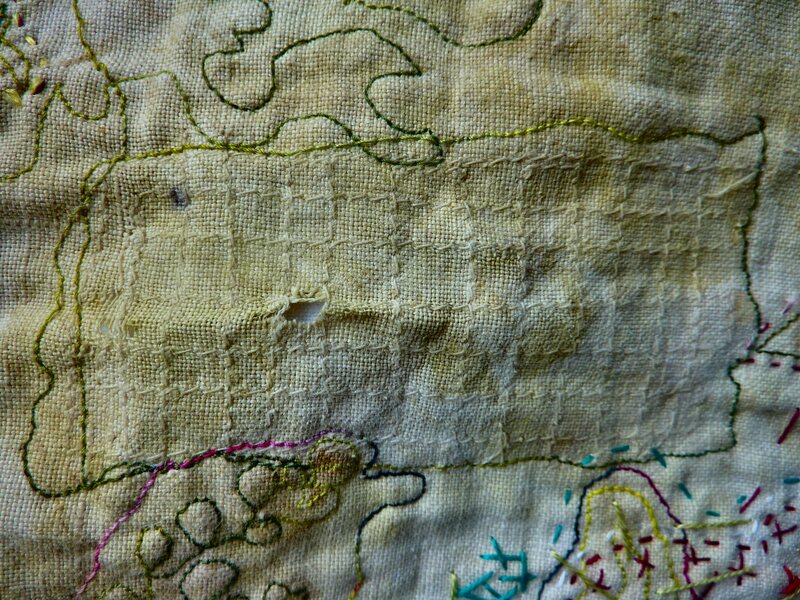 So when my linen bundles emerged from the steam pot, the old stains on the cloth re-emerged but in new colours under the eco prints, and I set out to follow all those marks. 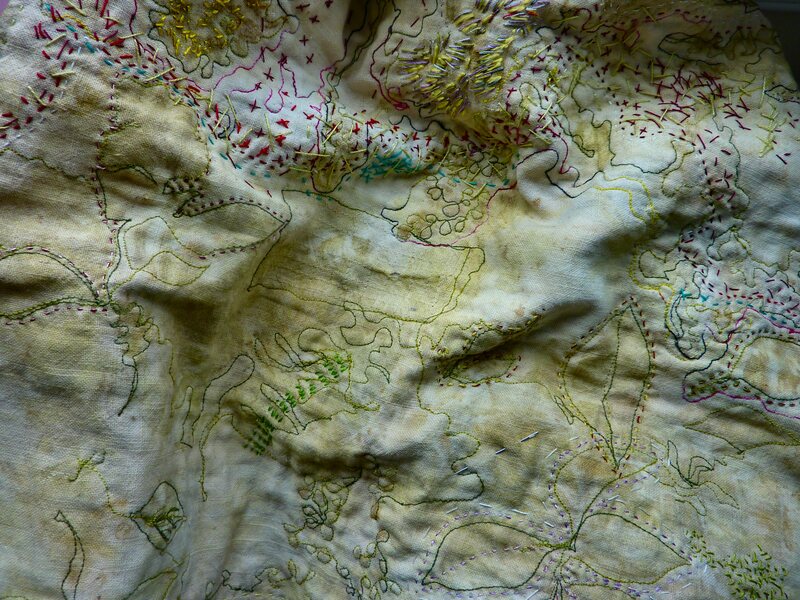 This is how the whole textile looks at this stage ( work in progress!) Don’t forget, you can enlarge the image by clicking on it and then again with the taskbar Google “magnifier”. It’s cool. And useful. I can see a lot more stuff that way than with my glasses. A note on the threads: They are from my stash, too. They are vintage threads from the 1930’s: Beldings’, a Canadian thread company (samples of the thread are in the collection of the Canadian Museum of Civilisation in Ottawa) made rayon and silk thread for embroidery. I found them at local vintage textile sale. Julia Caprara (now sadly deceased). Julia’s wisdom: “Trust your beginnings.” Colour, texture, handwork and design were all strengths but her love of her students, her sincerity in teaching and her devotion to her art were her greatest gifts. 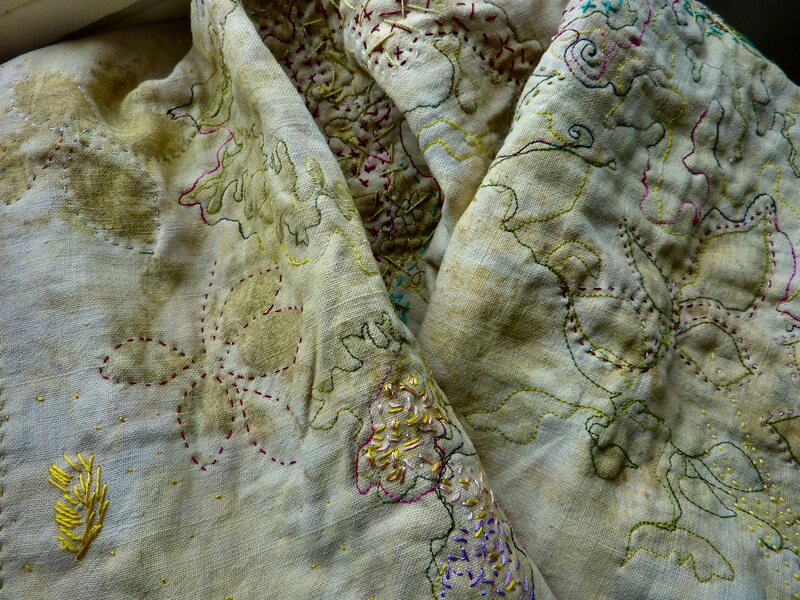 Ilze Aviks works wonders with the humble seeding stitch. 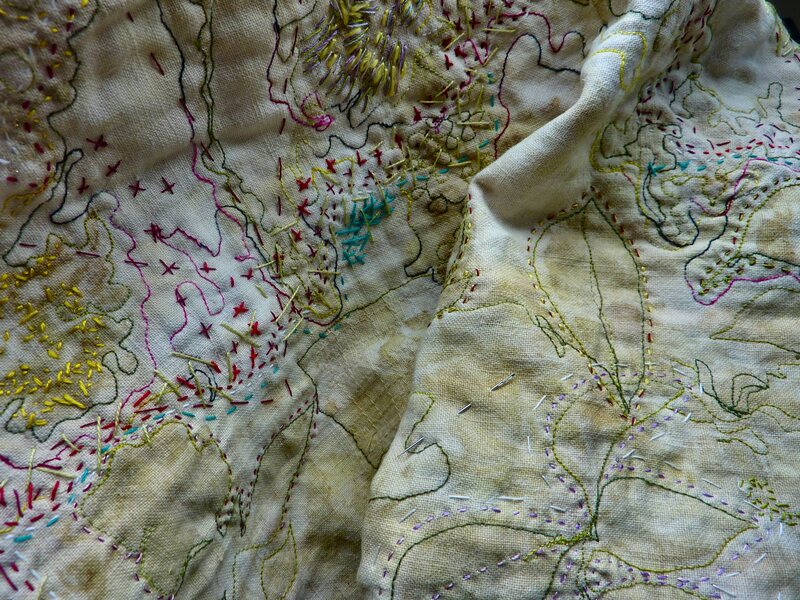 I have her books on embroidering marks with seed stitches – they are fabulous. Next post: Off topic. Some stuff I have been turning up from the stash as I clean out the stufio. Fibre jewels and accessories – all frivolity and fun! While waiting for the silk and wool panels to mordant. Sorry again about the formatting. Don;t know how to fix it yet. Thank you, arlee, for your insight. I would like it if I could always have simplicity, age and reverence shine through my own “life’s cloth” instead of those “dishrag” experiences. TG for art: yours, mine and many others’. Previous Previous post: Eco printing again with eucalyptus: Golden Leaves!